KJIPUKTUK (Halifax) - Another session of the House in Nova Scotia. Another effort by the Liberals to erode collective bargaining. 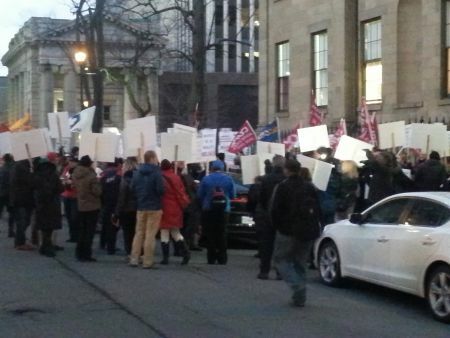 Another rally by angry union members at the steps of the Legislature. 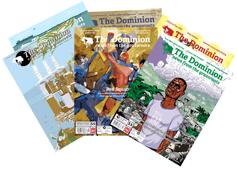 This time it is about Bill 148, the Public Services Sustainability Act. The legislation ensures that a wage framework of 0, 0, 1.0, 1.5, and .5 percent will be imposed on 75,000 teachers and provincial civil servants. Their salaries as a result will not even keep up with inflation. Earlier teachers, member of the Nova Scotia Teachers Union (NSTU), had voted against a similar offer. Members of the Nova Scotia Government and General Employees Union (NSGEU) were set to vote on the same framework in January. Teachers rejected the offer mostly because they wanted to go back to the bargaining table and see working conditions addressed as well. Bill 148 puts a stop to that. Teaching has become more complex and more expensive, in a sense, yet any discussion of working conditions have been taken off the table through Bill 148, said Meg Ferguson, a teacher and president of the NSTU Halifax County Local. “The change in the classroom climate over the last 30 years is significant. We now recognize that students have a wide variety of needs. One lesson for one class no longer works. We also have students with special needs, and altogether that spectrum is so much greater now,” Ferguson said. But now none of these issues can now be discussed at the bargaining table. “I feel very disrespected. We had a process. We said that we want to talk about all the other things as well,” said Ferguson. Judging by the crowd that gathered outside Province House many workers agreed with Ferguson. A rally called by the NSTU and supported by the Nova Scotia Federation of Labour, the Canadian Union of Public Employees, the NSGEU, the Nova Scotia Nurses Union (NSNU) and many others, was well-attended by workers from all parts of Nova Scotia. “We haven’t even met with our employer yet, and already the relationship is strained. We shouldn’t have to beg for our wages. We shouldn’t have to apologize because we have pensions and retirement allowances and sick time. We negotiated these benefits. We gave stuff up for that. And yet they can just come in and take it away,” Hazelton said. Danny Cavanagh, president of the NSFL, drew attention to a particularly mean-spirited move by the Liberal Chair of the Law Amendments Committee, preventing a hearing impaired witness to testify because he was late. “We will make sure that it is our mission to throw the goddamn McNeil government out of office,” Cavanagh concluded to loud cheers.” We are going to make sure that democracy is restored to this province.”.